Our modern, sunny, self-contained, ground floor apartment style accommodation is available for up to 4 people, complete with double glazed windows and underfloor heating, making it a great choice for both summer and winter holidays. 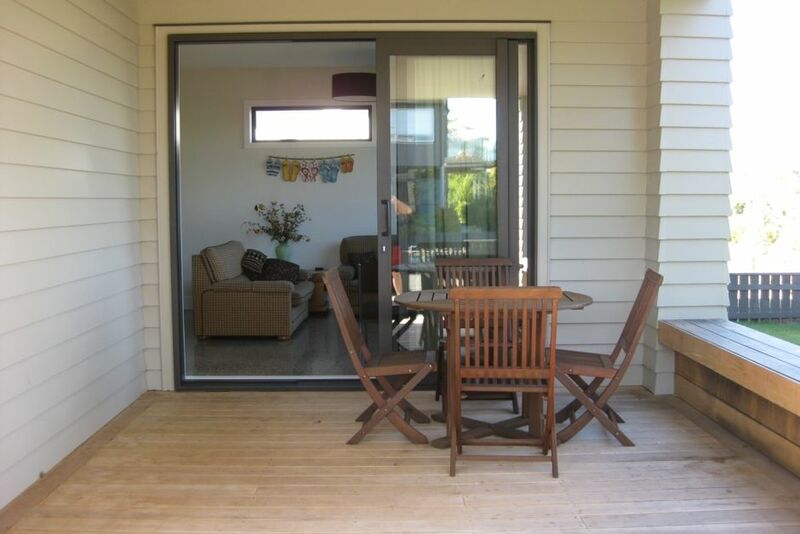 The ranch slider from the lounge opens onto a covered north facing deck, creating good indoor/outdoor living, ideal for barbecues. The living areas have polished concrete floors with carpet in the bedrooms. A fully equipped kitchenette includes 2 hob elements, small oven, single dishdrawer, microwave and fridge/freezer. Tea, coffee and sugar are provided. The spacious bathroom includes shower, bath and a separate toilet. All linen is supplied, just bring your own beach towels. Located in sought after Rainbow Point, 100m from the lake and Lions Walk. 200m from the local dairy, fish and chip shop and an English style pub/restaurant. 5Kms from town centre and 2Kms from the airport. An excellent base from which to enjoy all that Taupo has to offer, or to explore the Central Plateau. Just 1 hour's drive from Mount Ruapehu. Minimum of 2 night stay. 3 night minimum stay applies Easter, Christmas and New Year. Exclusive use of washing machine located in bathroom. Bring your own washing powder. Small living/dining area for up to 4 people. Fantastic apartment just perfect for our family. The Spacious deck was wonderful for relaxing at the end of a day exploring. The lake is just moments away. The photos don’t do the property justice! Our hosts were so welcoming and made us feel very comfortable with our two young boys. Will definitely be back again!! Clean,nice beds and linen,close to lake,well laid out. Enjoyed our stay immensely, would recommend to anyone who wants a relaxing quiet break.Away from the hustle and bustle but close enough to walk or drive to it.Thanks hosts for a wonderful stay everything was perfect. Excellent location in a lovely area. 2 minutes walk from the lake, 5 mins drive from the centre of town by car and 40 minutes walk on lake path. The property is modern and to a high standard. Would strongly recommend. This is a beautiful new property in a lovely setting and location. Would highly recommend.